Looks like the logo for our 1950s film production company. Actually, it’s more complicated than that (even though we would still like to use it when we go back in time to take down Universal). According to a release, the images were captured from 58 SkySentinel Allsky cameras, which are located in the US, Canada, Taiwan, India, Brazil, Australia, and other countries. The cameras record 24 hours a day, seven days a week, and upload all data to a server at the university. They were deployed by Sandia National Laboratories to monitor meteors and other events in the atmosphere. The students also used the activity to help to upgrade the camera’s system software in order to improve its accuracy. 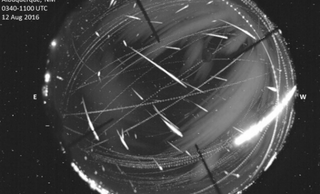 It gives us a new perspective of the Perseid shower, which we normally see from the ground. It looks stunning no matter where we’re viewing it.